This lotion is another product I heard about from the YarnThing podcast and, being a yarn lover, I was quite happy to try it out. The lotion is the result of a collaboration between a knitter and a soap-maker and was originally intended for gifts to be given away at a knitters retreat. The response to the lotion was the start of TinCup Arts. Currently, the lotion is available in 1 oz plastic push-up containers and is a solid lotion that you can smooth on or rub your fingers over and smooth over cuticles, etc. A cake shape is in the works that can be popped into a round tin or other container. The lotion contains beeswax, shea butter, apricot kernal oil, emu oil, aloe vera oil, T-50 Tocopherois (a natural vitamin E antioxidant that keeps the oils from going rancid), and essential oils and fragrances. The lotion melts at body temperature and is absorbed fairly quickly into the skin although if you use a lot of the lotion it will take longer to absorb and can feel a teeny bit sticky until absorbed. Because of the melting point, it is advised to not leave the lotion in hot areas, like near windows or in cars. 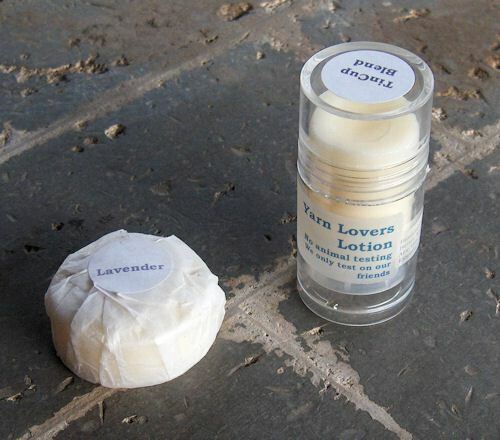 The lotion comes in several scents: TinCup Blend, Lavender, and Lime-Verbena. The TinCup Blend reminds me of my grandmother’s perfume, a little old fashioned scent with herbs from the garden mixed in. The Lavender is definitely a lavender scent but isn’t overpowering. When I received the lotion, I immediately rubbed some onto my hands, making sure to massage it into the cuticles, then applied some to my elbows. I then went out to get some supper and an hour and a half later, I could already tell that my cuticles and elbows had started to soften. Before going to bed, I massaged the lotion into my feet to see how it would work on dry and cracked heels. Within half an hour, the dry “cracks” on my heels were gone which never happens when I use any of the lotions I’ve purchased from local stores. Granted, my heels aren’t badly cracked, more of just a dry web of cracks, but this still made me happy enough to want to wear sandals! While you can’t purchase the lotion directly from TinCup Arts, they do have links to stores that sell the lotion in Colorado and Wyoming, and online (Black Water Abbey Yarns). For local yarn store owners, if you’d like to carry this lotion in your shops, contact TinCupArts@gmail.com – and let them know you read the review here!